Hyundai-Sime Darby Motors (HSDM) has updated its prices to include the 6% Goods and Services Tax (GST) implemented at the beginning of the month. The new stickers buck the general downward trend of other carmakers, as some models are now considerably more expensive than before. 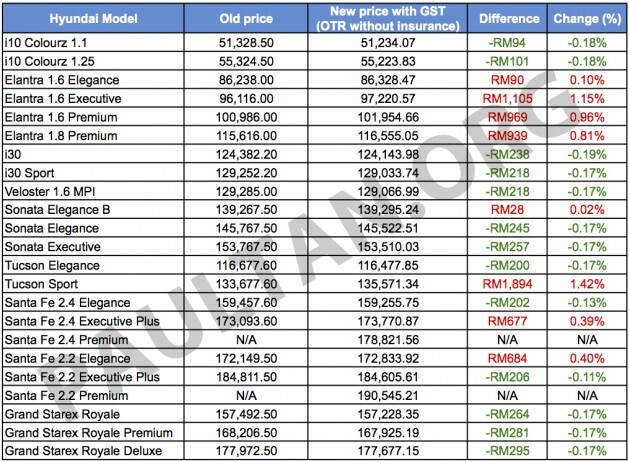 First up, though, the price drops – the cheapest i10 Colourz 1.1 has seen a sub-RM100 price drop, while the base Elantra 1.6 Elegance receives the biggest decrease of RM400, now sitting at RM85,928. Elsewhere – barring the 1.25 litre i10 (RM101 less) – the i30, Veloster 1.6 MPI, Sonata Elegance and Executive as well as the base Tucson Elegance and Santa Fe 2.4 Elegance models are all cheaper by between RM200-RM257. The rest of the range, however, is now more expensive than before, starting from a measly RM2 increase for the range-topping Elantra 1.8 Premium as well as RM28 for the base Sonata Elegance B. The mid-spec Elantra 1.6 Executive and Premium are pricier to the tune of RM709 and RM569 respectively, while the top-of-the-line Tucson Sport is dearer by RM1,894. The diesel Santa Fe 2.2 Elegance is also RM684 costlier. The biggest loser post-GST is the Grand Starex, with all models registering price increases. The base Royale model includes the biggest difference of them all, 3.02% higher than before. UPDATE: HSDM has informed us that it made an adjustment to the pricing of the Grand Starex range on January 1, 2015, where the price of the vehicle was increased – pricing of the Royale was revised to RM157,492.50, the Royale Premium to RM168,206.50 and the Royale Deluxe to RM177,972.50. Do note that the range-topping Santa Fe Executive Plus models are no more – taking their place are the Premium variants (with six airbags, a powered tailgate and a new Android-based navigation system); priced at RM178,821 for the 2.4 petrol and RM190,545 for the 2.2 diesel, they’re RM6,672 and RM5,734 more expensive than their predecessors, respectively. Both i40 Sedan and Tourer models have also disappeared from the price list – all allocated cars have been sold out, and no decision has been reached on importing new units – while the Veloster Turbo introduced earlier today was launched after the implementation of GST. New prices can be up, but the RV will be at all time low. Whatever price it is, the owner get back VERY VERY LITTLE during trade-in. I am enough seeing the husband’s sour face and wife’s angry face. Why is Sime Darby and Hyundai Malaysia not asking Najib to honour his promise to reduce car prices? How can reduction of 1 to 2% help Malaysians when there is a 6% GST on cost of living? Before the election, Najib promised the rakyat that if we voted for BN, he would reduce car prices by 30%. He assured and promised every single rakyat that we could trust BN in keeping their promises and BN NEVER mungkir janji. Now, 2 years have passed. Car prices have gone up actually. VW for example increased all their car prices by up to RM10k before the GST. Just like the NAP, here, BN still try to play the blur game. MITI should just instruct all companies to abide by MITI regulations, after all, MITI controls all car companies and all car companies are ultimately GLC and they should abide by their masters ie the Government. Anyway, getting back to Najib’s promise, it is high time MAA, MAI and MITI ask Najib to honour his promise to the rakyat of reducing car prices by up to 30%. Already we Malaysians are overpaying our cars by 3x the value of the car. for example, a 10 airbag Toyota Camry 2.5 in the US is US$22,000. Here, we pay RM180,000 for a 2 airbag Toyota Camry. How is a reduction of few hundred ringgit here help the rakyat who is already paying super high car prices and also going to bear the high cost of living with the 6% GST? Sime Darby which owns Hyundai Malaysia is owned by the Government. Where is the 30% your boss Najib promised? That’s why it’s important to vote carefully. True, your son saga RV still has best RV. Now 2014 Registered Toyota Camry 2.5 selling for below RM100k. Some say can even get RM95k. Got confirmed forummer here bought for RM100k. Car is accident free, only 10 months old. So, what RV you talking about? in 10 months Camry can lose RM80k! That is now the champion RV loss of any car. 2014 Camry 2.5 for 100k? Are you serious? If below 100k I’ll buy tomorrow. This bugger was shown the Hilux multiple times after he was denied promotions by his boss for driving a kimchi. Kahkah. Rm2 also want to count over something that cost more than rm100k. this is why we will never get cheap car here. RM 2 also cannot absorb. sudah lugi manyak woo, itu dua ringgit mau kira maa! Down price less then 1%; increase price always more then 2%. Another cronies example to increase price… not to mention others hidden taxes and excise duty ! Thanks BN for caring Rakyat. Increase price for Elantra? Why want to buy Elantra 1.6 premium OTR with insurance 105k and 1.8 premium 119k when you can get a fun to drive Mazda 3 GL 2.0 at 109k (also with 6 airbags/VSC)? Good lunch Hyundai… lol.. Strongly encourage all to buy new Hyundai. Hyundai sales already slow here. Now price increase… good luck. i40 is proof that even with a good product, Hyundai Malaysia cannot market it at all. I’m not surprised at the fact it’s been quietly dropped, mainly because nobody wants to buy it. They Malaysianised the car with a local audio system and some cheap looking rear entertainment systems, made it so expensive to buy and barely marketed it. In fact besides the Santa Fe, none of the rest are very remarkable. i10 is out of date, Elantra feels cheap, Sonata has the most appalling brakes in its segment. While the i30, Tuscon and Veloster are pretty forgettable too. On the other hand, sister company Kia is doing miles better with what is essentially the same car. I wonder how they even plan to sell the Genesis too. see how kia cerato k3 compared to hyundai elantra. even the 1.6 cerato k3 blows away the highest specs elantra in terms of equipment. because of the price. it failed already. i40 was from rm150k if im not mistaken. now im expecting the same for the new sonata. lol. only seen once this new sonata driven on the road.hyundai malaysia nowadays might have thought that are japanese brand where even before the car launched here people are already eager to buy. compared to naza kia, even they jacked up the price of cerato from forte before, but the equipment level is generous so it is still saleable. Day light robbery ! Price down RM 94 price up RM 4606, Junk car with premium price tag. What a pity…good cars but poor pricing & marketing strategy. I guess they want to make more profit thinking they can compete head on with the Sushi. Not quite there yet, in my opinion. Specially in our market where the Sushi are still the first choice unless the kinchi offer better cars spec at lower price. Why bother waiting for the RM30k discount when you can get RM100k discount buying a pen 18 month old unit? Congrats Mr. Loo. You must be very rich now, buying 2nd hand Kimchi cars at dirt cheap price and sell your hilat at god know what price. I’d prefer to wait for year end discount (or promo price/discount) knowing I get highest discount for a brand new car, not a second hand unit. 2 ringgit oso want to count??? Hyundai biz must be very poor…. Hyundai,Ford,Toyota….all has PNB trademark.Cannot run away from this shambolic fact….VERY VOLUPTIOUSLY HIGH PRICING. Why ? PNB has to give out very high dividends to amanah contributors each year. So,unfortunately these are the same people buying those cars. Well,cars remain ADDICTIVE,like nocotine. Very scandalously premium super duper high pricing will not deter buyers…cos cars are really very sought after every model launching or even facelifts. So,get it straight.Any Ford,hyundai,Toyota vehicle will NEVER,NEVER,NEVER BE priced cheap.Super duper premium pricing is a norm in Bolehland for these 3 brands. where is 30% car price reduction???? U still believe gov will reduce price? Since when gov keep their promises. Now, price height everywhere aft gst, car price reductions are negligible, removal petrol subsidies, misuse of rakyat money at ridiculous level, MP getting ridiculous raise of crappy job don while their spouse getting 4 figure hair job and many malaysian r struggling to put food on table. We as normal Malaysian are in very sad state. We are seriously screwed by our gov and yet still blur like sotong. 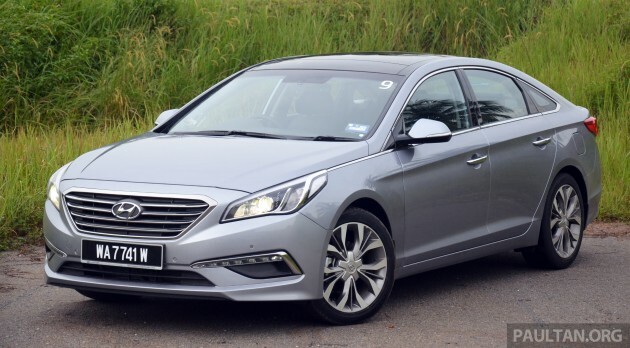 March 2014 Sonata owner willing to let the car go at RM38k. This is a new record low! Looks like the Camry and Mazda 6 launch sent shivers down the spines of kimchi owners oledi.